An installation of storytelling, music and art, Wolf of Baghdad takes you on a journey through a Jewish family’s memories of their lost Iraqi homeland. Bringing together a number of different elements, this audio-visual installation appears like a graphic novel, being pushed along by gentle Middle Eastern folk music. 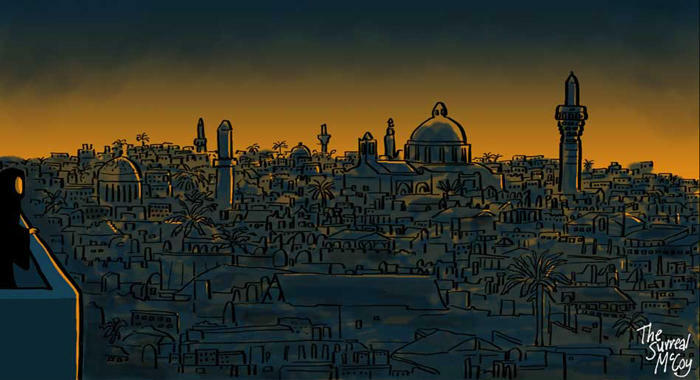 Graphic novels have been a popular medium in reporting and telling stories about the Middle East, from well-known series such as Persepolis, to modern classics such as Poppies of Iraq. This particular project has been put together with collections of stories and memories from the artist, The Surreal McCoy’s family and close friends. These were then drawn, and quotes were taken out, and put together to create an immersive experience. This is topped off by a live soundtrack performed by 3yin, who will also perform after the storytelling is finished. Expect intrigue, fascination and multi-sensory entertainment, a show not to be missed and a fascinating insight into a not-often told story.